Adriana Santiago assisted on the women's first goal, less than two minutes into the game. Photo by Wayne Gehman. 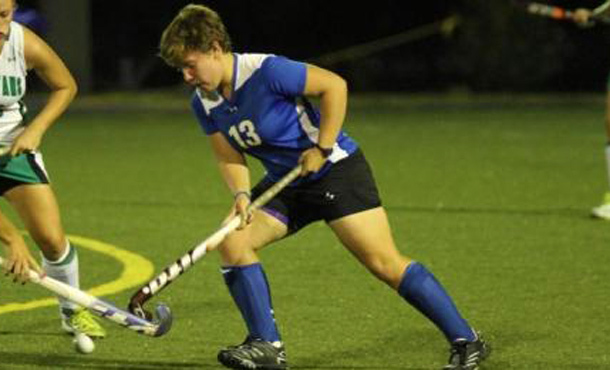 The EMU field hockey women got a much-needed ODAC win Saturday, taking a 2-1 win from Washington and Lee on the road. The victory snapped a two-game conference losing skid and evened their ODAC record at 2-2. The Lady Royals started quickly, firing a shot on goal less than a minute and a half in. On the rebound, Adriana Santiago (Souderton, PA/Christopher Dock) found Carol Brinkley (Chester, VA/Thomas Dale) three feet from the cage for an easy score. Brinkley’s second goal of the season made it 1-0. Play continued tight until the second half, when the women scored again in similar fashion. Melissa Cox (Mountville, PA/Hempfield) slapped a shot in the 55th minute which was saved. Jessica Blanks (Richmond, VA/Manchester) was there for the rebounded goal to push the lead to 2-0. The insurance proved necessary, as the Generals scored on a breakaway just over a minute later. W&L fired six more shots over the final 14 minutes, but EMU’s defense held for the 2-1 win. The Lady Royals had a 15-11 edge in shots, including an impressive 14-3 advantage in shots on goal. Mary Beth Danaher (Matoaca, VA/Matoaca) made two saves between the pipes to earn the win. Brinkley and Santiago each had five shots on goal to lead the team. Eastern Mennonite improves to 3-7 overall, but more importantly to 2-2 in the ODAC. The women are tied for fourth place in the league with games remaining against the fourth other teams in the middle of the ODAC standings. The Lady Royals play a non-conference date at Frostburg State on Tuesday, followed by an ODAC game at Roanoke on Wednesday.